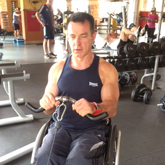 Ian began his career as an able bodied athlete representing Team GB at Powerlifting. He won his first British title in 1989 in the 67.5kg weight class, going on to become Teenage / Junior World Powerlifting Champion in 1992, breaking 3 world records in the process. After a sporting accident following the World Championships in 1992, he became disabled and a wheelchair user. After a long spell in hospital, thinking that his sporting career was at an end – Ian discovered Handcycling. He raced on the European Handcycling Circuit and was selected to represent Great Britain at several European and World Championships. At the time he was the most successful British male handcyclist winning numerous races. However, during this period, Ian developed problems with his neck and as a result was taken into hospital, resulting in his neck having to be rebuilt with metal plates and a carbon cage. He was moved to the neurology ward, where after extensive tests it was discovered that he had a rare Motor Neuron condition which affected various parts of his body. Whilst still in hospital, Ian realised that he would no longer be competitive at international level Handcycling, but not one to be deterred – Ian decided to look for a new sport. He made contact with Disability Shooting Great Britain and when he left hospital went along to try out 10 meter indoor air rifle shooting. He was asked to attend a fast track program to represent Great Britain for the London 2012 Paralympics. Ian was once again admitted to hospital for surgery to have a pump fitted to administrate medication to assist in his sporting activities, and unfortunately was not fit enough to compete in the Paralympics. 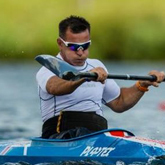 Again undeterred, Ian decided to look for a new sport and attended a talent identification day at Nottingham National Water Sports Centre for Paracanoeing and after successful testing at the end of 2012, was asked to join the Paracanoe Program. 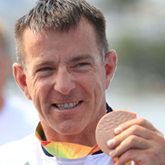 He has excelled in his new chosen sport and represented Great Britain at the European senior sprint canoe / kayak championships in Portugal 2013 in K1 200 meters, winning silver and then the World Championships in Germany again winning silver. In 2015 he represented the Paralympic team at the European Championships in Brandenburg and won gold with a new World Record. He also represented Great Britain at the World Championships in Moscow winning silver, and only missing gold by half an inch on a photo finish. He is now a full time athlete on the Paralympic Program working towards the Rio 2016 Paralympic Games.